← Will the real Candy Cane Loop please stand up? Peach Valley: So much more! Peach Valley: Intersection of Eagle Road and Sidewinder Trail. I'm on Eagle Road (really a double-track) and am looking approximately north. Note the sidewinder trail. Note also the arrows. There is no room for error! I did not attempt it, but continued on up the Eagle Road to try a bit of Spikes Trail. Peach Valley, in Montrose County, Colorado, is one big place. It’s in the Gunnison Gorge National Conservation Area, hard up against the Black Canyon of the Gunnison National Park and other associated wilderness areas. The Gunnison NCA includes the Peach Valley area and this time of year, it’s a favorite haunt for those on two wheels. With an engine, that is. This post pulls together rides from April 15th and April 16th. The orange GPS tracks are from the 16th, the red are from the 15th. I’ve got lots of pictures here, plus a nice GPS map of the entire area. Peach Valley parking area near Olathe, Colorado. From Olathe, travel east on Falcon road until it becomes gravel, then cross the bridge, go around the corner, and there you are. Note the area is quite large, with picnic areas, pull-ins for trailers, and a ramp to back up pickup trucks to offload motorcycles and ATVs. Note how many people are there, and this was a Saturday. Sunset Rocks Trail warning sign. See the little icon circled in blue? It reads "Most Difficult." Rats—I'd been wanting to try it. One of the trails I wanted to attempt starts at the intersection shown in the top photo and runs south. From where I’d been, it looked like it was pretty level. So…I got as far as the warning sign shown in the photo on the left. Hmph…”most difficult.” So I found a likely spot and turned around. You can see the trail behind the sign—looks pretty level, doesn’t it? I guess I’ll never know. Let’s look at the GPS map below, collected over the course of two days. Believe me, this is only a fraction of the trails available. The free riding area (meaning you can go anywhere you please) is limited to the vicinity of the Peach Valley parking area. 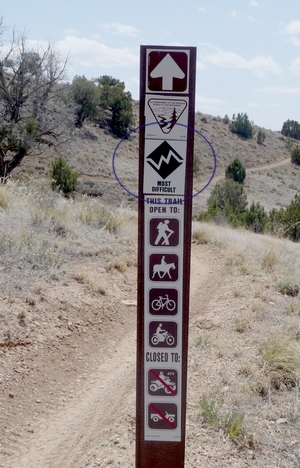 Beyond a certain (seemingly irregular) distance, one must stay on “marked” trails. The term “marked” is a bit of an overstatement, as markers are not frequent. You can see the Candy Cane Loop (see previous post) down in the bottom left. I chose to go up to a parking area that marks the northern end of Chukar Road by following a marked trail that paralleled Peach Valley Road. I poked around a bit, then headed north on Peach Valley Road to the Eagle Road parking area. I followed this up a ways. On the 15th I attempted Spikes Trail, which wasn’t too dreadfully difficult, though rocky and steep. But I came to an area where the trail needed to stair-step up a bunch of rocks. I knew I could go down this area, but I could see that my little 250cc Yamaha XT-250 simply didn’t have the oomph to power up it, especially carrying 200+ pound me. So I turned around. Shame…I’ll have to find the upper end and come back down it. From there I attempted the Sunset Rocks Trail, but immediately encountered the sign saying “most difficult.” Given how many of the “ordinary” trails are actually quite steep and rocky, I figured if someone went out of their way to mark this as “most difficult,” discretion would be the better part of valor. The GPS map is below, with more text below that. Northern Peach Valley GPS map. See text. Note yellow line for scale: the line is one mile long. When traveling these rough trails, that mile can take quite awhile. The background for this map is what's called "Color DOQQ," a kind of imagery the federal government provides. I got it via DeLorme. So, I was at that intersection both days. On the 15th I went down Wave / Eagle Road, a nice, straight road (“road” meaning a 4WD vehicle can use) and then looped up Wave Road. Let me tell you a little about Wave Road. It’s steep and full of rocks—both the loose kind and the big embedded kind. Oh, and did I say it’s steep? It follows the rim of a deep canyon and the views are stellar—once you’re on top the road becomes much easier to ride. But then it tees into another road. Someday I’ll follow the right hand track, but discretion and memory pushed me to the left onto Red Rocks NH Trail, which is a “road.” It follows along another canyon rim, again with incredible 360° views. But…then the ridge does what lots of ridges do, and plunges downward. I’ve been down this stretch a few times. It’s steep, rocky, steep, and rocky. A controlled descent with the motorcycle in first and a very light touch on the brakes kept me upright and moving. This road ends at the Bobcat trailhead and overlook. If you follow the hiking trail, you need to purchase a wilderness permit (I did last year—see here and here). I went down Bobcat Road. As it turns out, the first couple miles is a pretty rocky descent. Many hikers park further down rather than attempt to navigate this part of the road. But then from there it’s a quick trip down to Peach Valley Road. Let’s finish up with Candy Lane (not Candy Cane) Road. When dry, this road is perfectly navigable, but do look out for erosion and ruts. As you can see from the track, I crossed over a single-track marked trail and backtracked to follow it (that’s where the track wiggles a lot). I took an unnamed cutover road to Peach Valley Road. Again, you can see I turned around to travel a marked trail (I think Elephant Leg or something like that) that followed the creek bed, which is why the line wiggles and why it doesn’t quite align with the dark line which is the road. This was an interesting trail. To reduce erosion, every so often the creek bed is filled to the brim with dirt The trail simply goes straight over these. I’d suggest some momentum before attempting this. I judged my momentum so that I could come to a stop at the top of each just to make sure no one was coming the other way. Eventually the trail dumped me out onto Peach Valley Road. I haven’t begun to go on all the trails in this area, so I’ll be back. Plus, the high country isn’t really open until late June, so I’ll have plenty of time to tackle more trails. 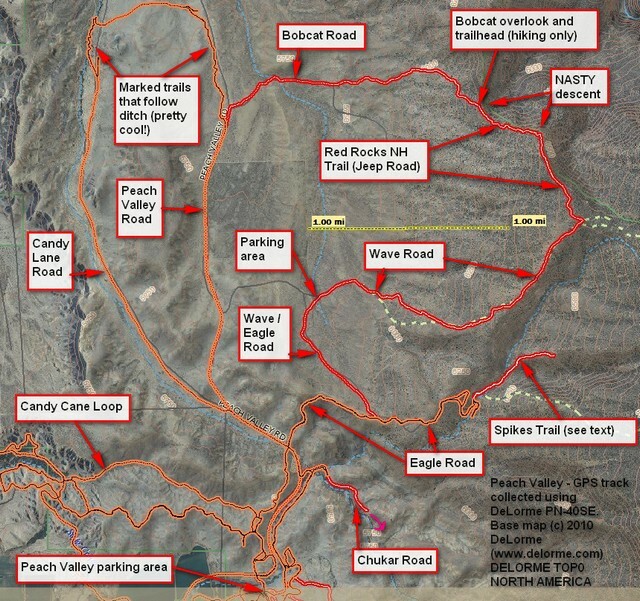 This entry was posted in GPS Tracks, Montrose County, Motorcycling and tagged Bobcat Road, Candy Lane Road, Colorado, DeLorme PN-40SE, dirt bikes, Eagle Road, Gunnison Gorge National Conservation Area, montrose county, motorcycling, Peach Valley, Peach Valley Road, Spikes Trail, Wave Road. Bookmark the permalink.